I admit I was nervous to go on a plane trip this far into my pregnancy, but I kept hydrated and moving around on the plane and bus rides. And a lot of people were praying for the safety of our babies. Everything seems to have worked out ok :) And I loved, loved, loved spending 4 days away from home with Alan <3 He is the best! Also a highlight of our trip: Alan got to see the babies move from the outside for the first time!! In front of Mt. Rushmore! So amazing to see it in person. Standing in front of the Crazy Horse memorial model. This is the goal for the mountain carving in the background; it is a memorial honoring the American Indians. So far they have the indian's face done (which you can see in the background) & they are starting to work on the horse's face. It will be impressive once it's finished. In Deadwood, SD after a play that depicted the death of Wild Bill (on the left). Alan got roped in to playing the bartender for the play. Jack McCall (Wild Bill's assassin) is on the right. On the set of Dances with Wolves. I haven't seen this movie, but Kevin Costner was standing right in front of this desk in one of the scenes. Two heads, and they are facing each other! So cute. 3 days before the appointment at a friend's baby shower. My new due date is September 7th, so today I am already 24 weeks 1 day. We are viable! The tech said they are definitely both boys. I guess they are just that manly. My cervical length is good. My OB said I was hiding the twins well :) And her advice was to keep growing just like I am. She said if I do, then I shouldn't feel too bad during this pregnancy. I saw one of the babies move from the outside this morning! Baby Movement: I'm starting to feel them from the outside just about every day. And Alan has gotten to feel them several times as well! :) It still seems like twin A is a little more active than twin B. Energy Level: I worked two days in a row last week, and it almost killed me. (I also didn't get good sleep at all before either of those shifts.) I had to rest for the next two days. Our census at work has been high for the last week and a half, so I've been getting calls almost every day to work extra. Usually I don't have a problem working a little extra, but I think it's more important right now that I don't push myself if I don't have to. So I haven't been answering the phone :) Plus until I hit about 30 weeks I am going to be really paranoid about premature labor. I don't want any 24-29 weekers. Also... Happy Mother's Day to all of you mothers! I kind of miss getting full after eating a meal. It's a lot of work eating all the time. I just want to go to sleep but my stomach is growling! It's only been two weeks and a day since I was seen my a midwife & had the ultrasound, but I haven't talked to any professionals (besides nurse friends and neonatologists at work) since I found out I was having twins (because my ultrasound was after my midwife appointment). 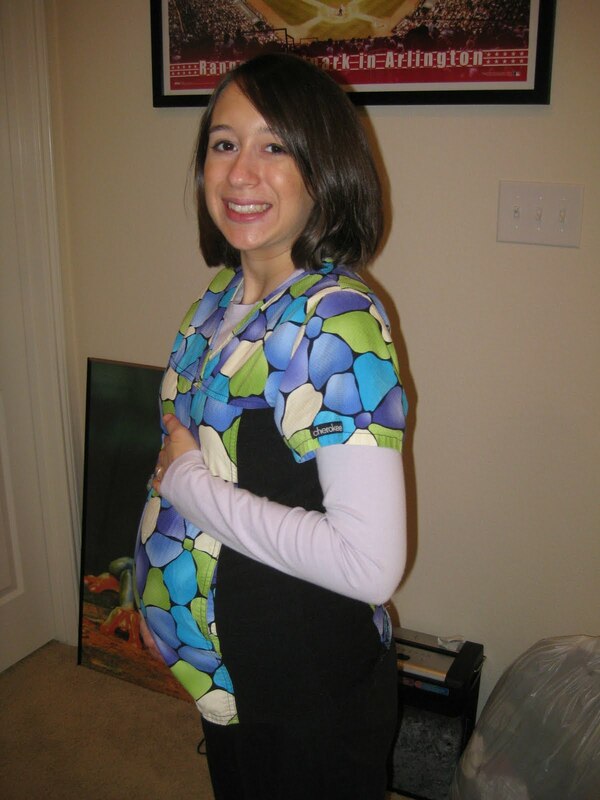 I was getting tired of not having a practitioner and not knowing what the plan was going to be for the rest of my pregnancy! So today I felt like I finally got to discuss the twin situation with my new doctor. I actually went with a different doctor than I originally intended, because the other doctor couldn't see me for another 3 weeks, and I thought that was too long. Maybe I am just impatient. The medical assistant was able to hear both heartbeats right away. They were both strong, although I didn't get the exact bpm. The medical assistant is actually the mom of 6 year old identical twin boys! So I told her... "I guess it is possible" ;) Weight gain so far: 13 pounds. I am going to be seen every two weeks from now until 32 weeks. Then, I will be seen weekly. 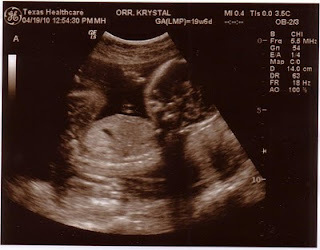 And I will be having monthly ultrasounds to check the growth of the babies. So lots of monitoring! 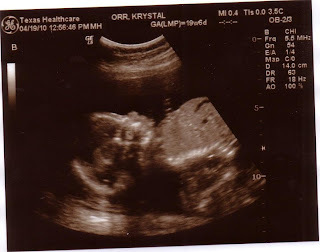 My next ultrasound is two weeks from now. They said they are sending me to the best ultrasound tech at the clinic, because they want to get really good shots, and see if they can tell one more time if they babies are in separate placentas. (This would be the best situation as far as the level of risk). They are definitely in their own sacs within the placenta though.. so that is good. Also at 26 weeks I am getting two steroid shots, 24 hours apart, to help develop the babies' lungs in case they are delivered early. Since twins are more likely to be delivered. Also my doctor talked to me a little about the actual delivery. (Which is exactly what I wanted to discuss!) And let me just say... my goal has always been a natural, epidural-free birth.. but that was before the twins & before I heard about my birthing options with twins. Now I'm thinking the epidural sounds preettty good, but we'll see what happens. So, the doctor said she has never had to deliver twins with a combination of vaginal & c-section. This was music to my ears, because the recovery for that sounds pretty intense. She said if there is no medical necessity/emergency and twin A is vertex (head down), she usually tries a vag delivery. 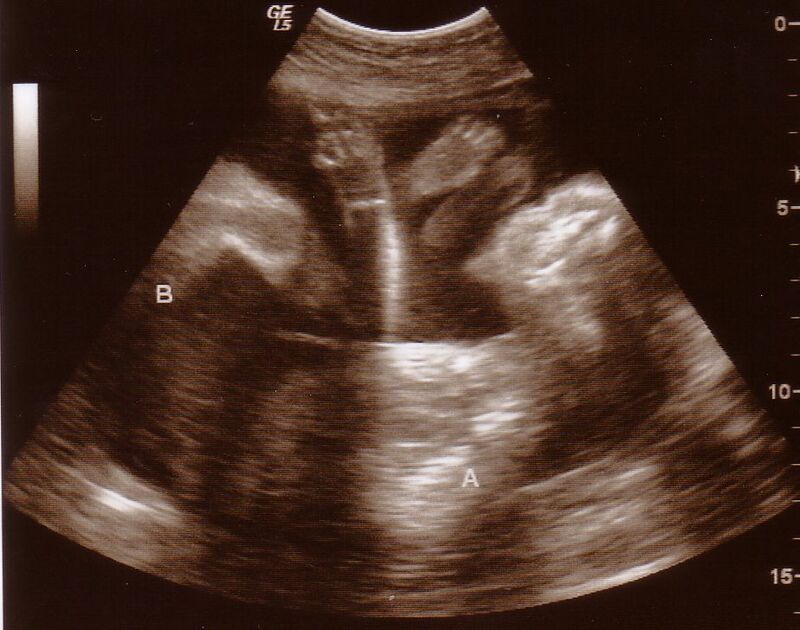 Then twin B usually is floating around in a strange position, so usually a little manipualation is needed (as in the practioner grabs the feet), and twin B is usually delivered breech. This is safe since the cervix has already dilated and delivered one baby. I asked if both babies are ever delivered vertex.. and she said it does happen if twin B rotates into that position after the first birth, but it's much more common for the second to be breech. So it sounds like I will only get a C-section if I really need it.. which is good.. but the whole manipulating the baby while he's still inside scares me a little! She said all the doctors in the practice have the same philosophy too, just in case I am delivered by an on-call doctor. Baby Movement: The babies are getting stronger. I think I felt them from the outside 3 times in the past few days. Mainly I just feel stronger nudges/flutters from the inside than I did before. A lot of the movement is on my left side.. which is where baby "A" is hanging out. I dunno if he is more active than baby "B" or if it's just his position in there. Weight: Gained 12.5 pounds so far. Maternity clothes that seemed huge just a few weeks ago now fit me quite nicely. Appetite: Noticed an increase in appetite especially from week 17 on. Now that I know there's two, I've been really trying not to skip meals & concentrating even more on drinking as much water as I can. I really really want to carry these babies for as long as possible (being a NICU nurse I know every week counts... and we see so many twins that it makes me nervous), so I am trying to eat good food & keep myself hydrated. Energy Level: Not too bad. Definitely improved from the first trimester, although I still get worn out faster than pre-pregnancy. Also trying to get some exercise.. but to rest when I'm tired. People's reactions: Definitely more people staring at my stomach as I pass. I feel like I'm getting bigger every single day. Also I get two completely different reactions when I tell people I'm having twins. 1) "Really? But you're so tiny" or 2) "I knew you were popping out really fast!" So I really don't know which one it is! It may just depend on what I wear. Doctor: I was being seen my a group of midwives that delivers at the hospital where I work. 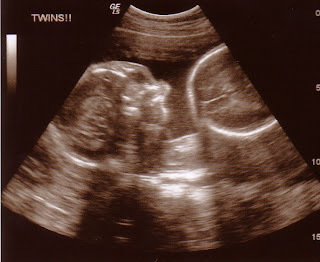 However, when they found out it was twins, they kicked me out! (I would have gone with a doctor anyway... just because of the higher risk of complications with two... but they didn't even let me make the choice, lol). I chose a doctor... but it has been a huge pain getting the midwife office to send over my medical records & to get an appointment. Yesterday the doctor's office FINALLY called saying the received the records & made an appointment with me. But I was not at home & didn't have a calendar in front of me. So I'm not sure now if they appointment is this coming week or 3 weeks from now (which I would not like.. I haven't been seen since I got the news). So I am calling them on Monday to double check. Also I forgot to mention this on my last post... but the babies weighed 10 oz. 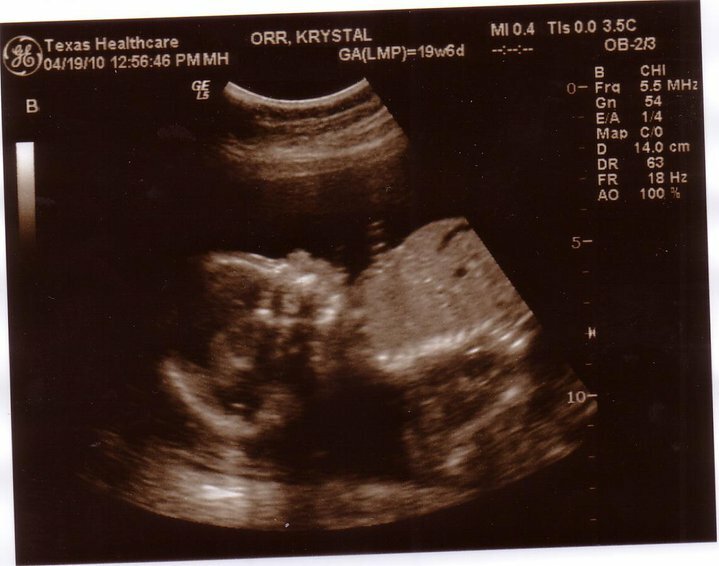 each at my 19 week ultrasound. The tech said I was "growing them well." Also she said everything looked good health-wise.